If you share the same concerns and interest in animals as Volunteers For Animals, consider joining us either as an active member or contributing member. Active members assist at the shelter, pet education, pet therapy, fund raisers and attend meetings. Contributing members make monetary donations and/or donate supplies used at the shelter. Membership dues are required when you first join VFA. Then in January of each year, we will send out reminders to all members to pay dues if they wish to continue being a member for the upcoming year. Monthly meetings are held the first Tuesday of each month at the Shelter at 6:30 pm. Or, pay your annual dues through Paypal. Click on the button below to pay online. HELP WANTED: PART-TIME HELP WANTED AT THE GENESEE COUNTY ANIMAL SHELTER; EXPERIENCE GREAT BUT WILL TRAIN; MUST BE WILLING TO WORK HARD FOR NO MONEY AND LOTS OF LICKS AND PURRS FROM FURRY RESIDENTS; MUST GIVE A COMMITMENT OF AT LEAST 3 HOURS PER MONTH FOR AT LEAST 6 MONTHS; OPENINGS FOR FRONT DESK, ADOPTION GREETERS, DOG WALKERS, MEDICAL ASSISTING, GROOMING, TRANSPORTATION, PET THERAPY, ADVERTISING AND PROMOTION, EDUCATION, GRANT WRITING, FOSTERING, NEWSLETTER, CAT SOCIALIZERS, AND GROUNDSKEEPERS. PRINT OUT A VOLUNTEER APPLICATION FORM AND RETURN IT TO THE SHELTER ATTENTION: VOLUNTEER COORDINATOR. ALL VOLUNTEERS MUST BECOME MEMBERS OF VOLUNTEERS FOR ANIMALS, PAY ANNUAL DUES AND ATTEND AN ORIENTATION PRIOR TO VOLUNTEERING AT THE GCAS. ANYONE BETWEEN THE AGES OF 10 AND 17 YEARS MUST VOLUNTEER WITH A PARENT AT ALL TIMES. THE PARENT MUST COMPLETE AN APPLICATION, BE A MEMBER, PAY DUES AND ATTEND AN ORIENTATION WITH THE CHILD. ALL VOLUNTEERS MUST HAVE CURRENT HEALTH INSURANCE. PLEASE COMPLETE THE APPLICATION, READ THE AGREEMENT AND SIGN, AND RETURN TO VFA. A VOLUNTEER WILL BE IN TOUCH WITH REGARDING THE NEXT ORIENTATION. THANK YOU. IF YOU ARE A CAT PERSON: We are in need of volunteers willing to take in mother cats and her kittens. You must become a volunteer to foster animals. Volunteers For Animals provides food, cat litter, vet care and any other necessary supplies. Mom and kittens are kept in foster homes until they reach 8 weeks of age. IF YOU ARE A DOG PERSON, We are in need of volunteers willing to take in rescue dogs. You must become a volunteer to foster animals. Volunteers For Animals provides food, vet care and any other necessary supplies. These dogs are not considered county dogs so they do not stay at the Shelter. Foster parents must be willing to bring the dogs to the Shelter for adoption hours. 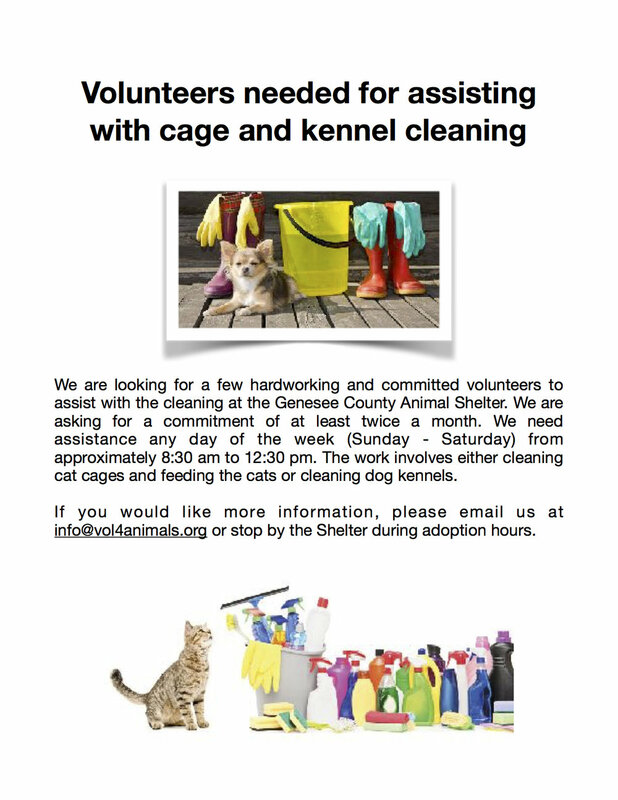 If you would be interested in this very rewarding job, please email us or stop by the Shelter during adoption hours to speak with a volunteer.